Remember when exercise meant playing kickball with neighborhood friends and Capture the Flag during recess? As a kid, I never went in search of a new workout or felt like I needed to check it off my list for the day. I got a workout without even trying! Boy, when did exercise stop being fun? If you can't remember the last time you enjoyed a workout, try this one, which takes place at an outdoor playground. It's a guaranteed fun time! Perform each exercise listed below and complete the circuit as many times as possible in 15 minutes. Use a timer and keep track of how many rounds you do. Try to beat that number the next time you do this workout, or compete with a friend or family member to see who can do more rounds. A little friendly competition will definitely add some fun to your workout! 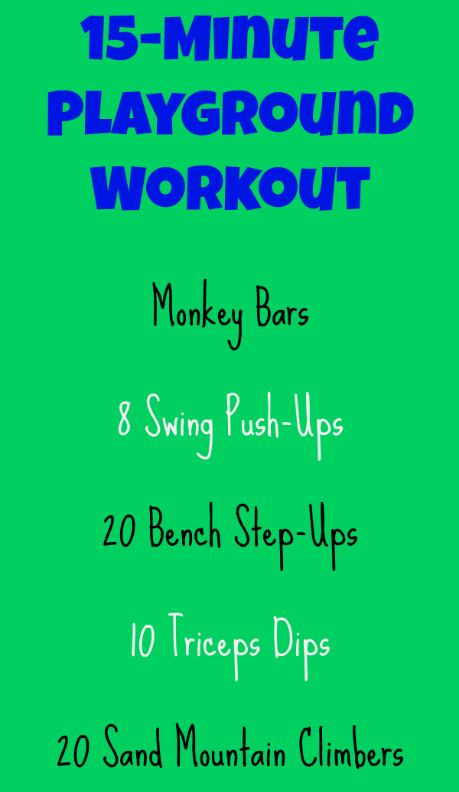 Monkey Bars: Use your upper body strength to take you across the monkey bars and back again. Unsure how to navigate the money bars? Here's a tutorial. Swing Push-Ups: Get into a plank position near a swing and then put your feet on the seat, so you're in a push-up position. Perform push-ups with your feet on the swing seat and your arms supporting you. The instability of the swing will force you to use your core, which makes the push-ups more of a challenge. Be sure not to rush through this movement. Take it slow and really work your upper body and core. Bench Step-Ups/Jumps: On a bench or set of stairs, step up and down at a rapid pace. Each right and left step counts as one rep. Need more of a challenge? Jump on and off the bench for 20 reps.
Triceps Dips: Using a bench or bar, perform Triceps Dips. Sand Mountain Climbers: In the sand, get down and do Mountain Climbers. Each leg counts as one rep. The unstable, sandy surface makes the movement challenging and fun at the same time! Please consult your doctor before starting a new exercise program. Go Outside and Play—Your Health Depends on It!